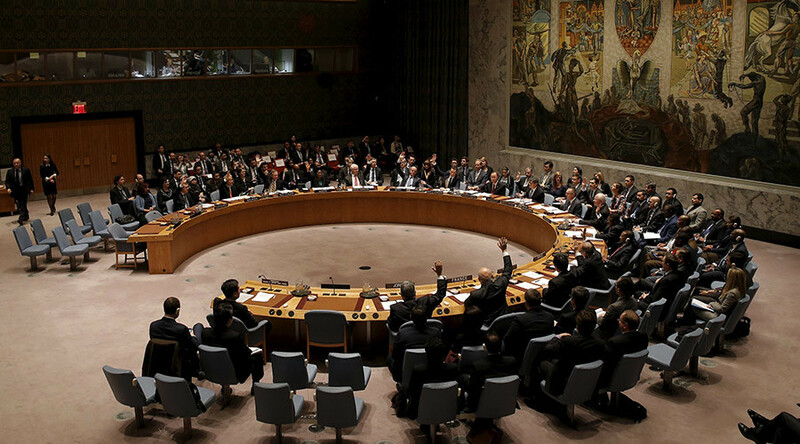 The UN Security Council has passed a resolution strengthening legal measures against those doing business with terrorist groups. It targets mainly Islamic State militants (IS, formerly ISIS/ISIL). The resolution is the result of a joint effort by Russia and the US, which are both leading anti-IS campaigns in Syria. It stems from a UNSC action taken in February against illegal trafficking of antiquities from Syria, which threatened sanctions on anyone buying oil from IS or the Al-Qaeda-linked Al-Nusra Front and urged that kidnap ransoms not be paid. “The countries did have respective obligations well before this, but, unfortunately, those obligations have not been observed by everyone and constantly,” he said. Some of the sanctions the UN could impose include asset freezes, travel bans, and arms embargos. The resolution also asks countries to report on what they have accomplished in disrupting IS’ financing within the next 120 days. It also calls on UN Secretary-General Ban Ki-moon to write up a “strategic-level report” analyzing IS’ sources of revenue within 45 days. “We are counting on it to be a very concrete and honest report,” Churkin told RT. According to the UN envoy, Russia was the only member that could provide proof of concrete schemes used by other countries to engage in illegal oil trade with Islamic State or how IS able to use the revenue from those transactions to purchase weapons from other countries, particularly from a few in Eastern Europe. The document, which is based on UN Charter Article VII and takes effect immediately, calls for members to “move vigorously and decisively to cut the flow of funds” to IS. IS is estimated to be one of the wealthiest terrorist groups in the world. Some data compiled in an analysis by IHS estimates that the group’s monthly revenue amounts to some $80 million. Major breakthrough for US-Russia relations? The joint effort by Russia and the US marks what appears to be a major breakthrough in thawing the icy relations between the two world powers. On this rare occasion, the countries were able to work together and discuss the issue in the same vein: “Denying [IS] access to the international financial system is a key element of any comprehensive strategy to degrade and ultimately destroy it,” US ambassador to the UN, Samantha Power, said in a statement. The UNSC resolution comes just days after US Secretary of State John Kerry’s Tuesday visit to Moscow. Following talks, Kerry and Russian Foreign Minister Sergey Lavrov said that Russia and the US have agreed on a number of “critical” issues, particularly with regard to Syria. “The US stands ready to work with Russia,” Kerry told journalists. On Thursday, Putin also stressed that differences between Russia and the US on Syria have narrowed. The Russian plan for solving the conflict “strangely as it may seem, coincides with the US vision in its key aspects: joint work on a constitution, creation of instruments of control over future early elections, holding the vote and recognizing its results on the basis of that political process,” Putin said during his traditional end-of-year Q&A session with journalists on Thursday.